Calling all cherry lovers..... they are HERE!! Well if you live in Kent they are, haha! Fresh cherry stalls are popping up on roadsides, with juicy cherries, freshly picked that morning. They will be here for another 3-4 weeks, so make the most of them while you can. 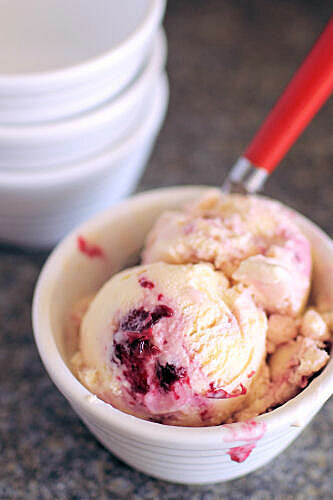 My favourite ways to use them: jam, cherry pies and ice cream - DELICIOUS! 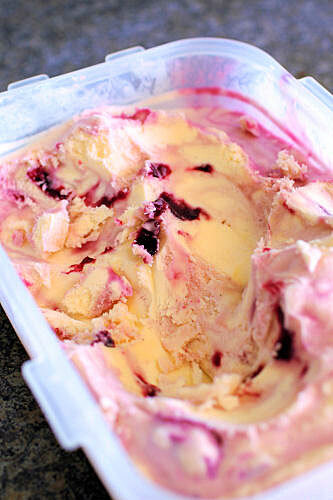 The hot and sticky, windows wide open at night, weather is perfect for cherry swirl ice cream. The cherries are so full of flavour and juice - my kitchen always looks like a scene from a slasher movie after pitting several kilos of the things. 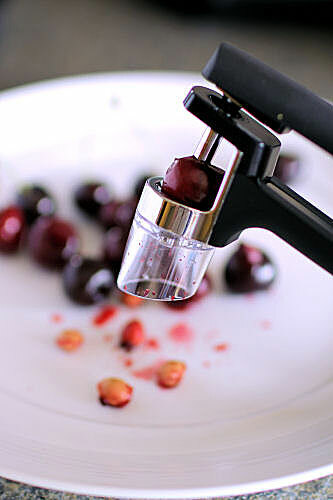 This year I replaced my old pitter with a new one, one that comes with a little juice shield, requiring no fiddling to get the cherry in the right place before I attack it, disemboweling with one quick squeeze. I haven't written a recipe out, because you just make your favourite vanilla ice cream (or you could cheat and soften up a carton of good quality store-bought vanilla ice cream). Add some home made cherry jam swirled in with a spoon (you could cheat again with store-bought) and freeze in a container until ready for use. I use a David Lebovitz recipe for the jam, it's really easy - you just weigh the cooked cherries and add ¾ of the amount in sugar with some lemon zest and juice, no pectin needed. I also added a tablespoon of Cointreau liqueur to the amount of jam that I was going to put into the ice cream. Love the soft pink swirls in your ice cream! Btw, cherries are finally here too! I used them to make a tart - without a cherry pitter, because I couldn't find mine (if you'll look up 'glutton for punishment,' you'll see my picture). 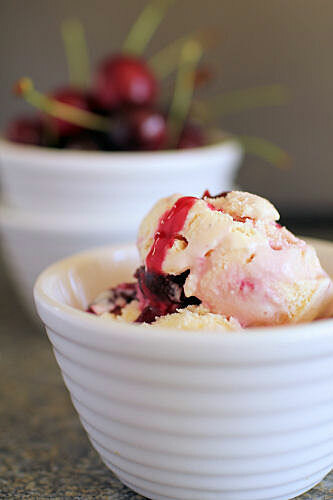 I would love to make your cherry ice cream next. It'll keep me cool and less frustrated. 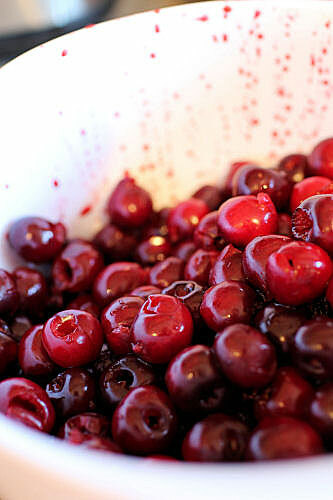 i LOVE fresh cherries and i STUFF myself with them when they're in season. this is a beautiful ice cream! Looks amazing! I love Ice creams! Mangos are in season here. I love them still I do so envy you your cherries!